WhatsApp Inc- was founded in 2009 by Brian Acton and Jan Koum, both former employees of Yahoo!. After Koum and Acton left Yahoo! in September 2007, the duo traveled to South America as a break from work. Through the bot users can search for content on Wikipedia, access some news articles and even engage in simple mobile quizzes. 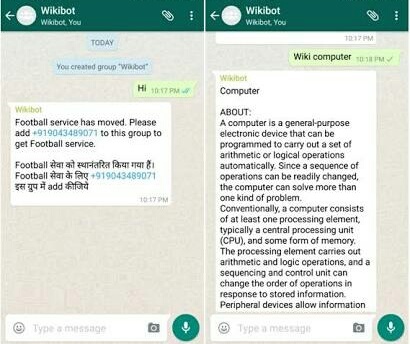 To access the bot users need to save any one of a list of specific phone numbers and add this number to a new or existing WhatsApp group. Create a new whatsapp group and just save any of the numbers i listed below with any name of your choice to your contact. Note: this service is free thanks. "Service is free and you should spam" Mathias no kill me with laugh.. Yeah i came across this, had it on my blog, itz a very nice development o.
I knew about this lol most especially "Jumble"
Nice one from Whatsapp, at least Google have seen a moderately packed competitor. This is interesting and real funny to me, I will try it out. Lol.... I laugh in french. Make we spam.